Orange County’s lease option period inches to a close on Oct. 31, but reality of Dana Point Harbor’s revitalization might still be 12 years away. DANA POINT — California coastal cities just cannot get away from redevelopment these days, but one of the most enduring sagas of waterfront development has consumed Dana Point for the past 21 years. A hallmark moment came in July when the Orange County Board of Supervisors approved a draft lease with the specially formed developer Dana Point Harbor Partners. Consisting of the “best management practice” individuals for the job, Dana Point Harbor Partners are made up of three individuals, all of which have an impressive portfolio of developments, including Joe Ueberroth of Bellingham Marine & Bellwether Financial, Bryon Ward of Burnam-Ward, and R.D. Olson. The partnership is split evenly into thirds with Ward taking responsibility for the commercial portion, R.D. Olson taking over the hotel construction and Ueberroth developing the marina. While some details of the revitalization are known, including a comprehensive construction schedule estimating the majority of tasks will take beyond 2023 to finish, those involved with the revitalization project are keeping design elements close to the cuff. 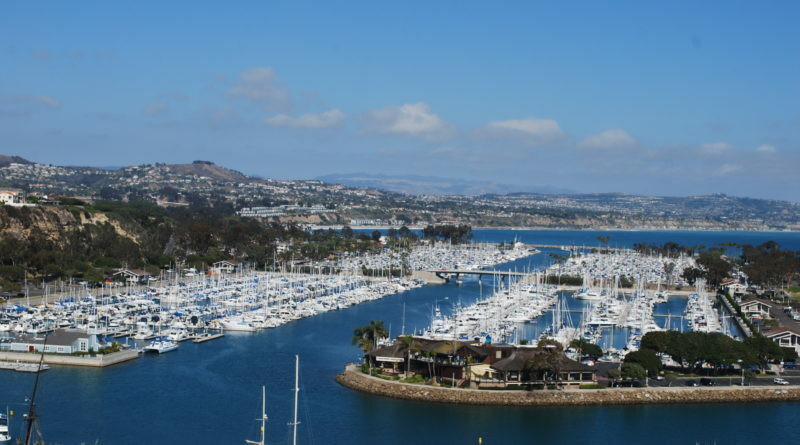 At this point, according to Dana Point Harbor Partners and Orange County, the project ahead appears to focus on a basic rebuilding of the harbor according to the Local Coastal Plan. Between approvals, permits, further public feedback sessions, feedback from the California Coastal Commission and more, it appears Dana Point’s revitalization, even after 21 years of stalls, is still not going to manifest overnight. The process and organization are still as chaotic as ever — many questions have still gone unanswered. Dana Point Harbor Advisory Board (DPHAB) held a public meeting at the Ocean Institute on Sept. 24. Stacy Blackwood, director of OC Parks, and Thomas “Mat” Miller, Chief Real Estate Officer, were hosted at the meeting as representatives for County of Orange and the Dana Point Harbor Partners. At the beginning of the meeting, Ward prefaced the presentation stating that there would be “a lot of placeholders” and that he hoped the community would be patient with the process. Developers rarely shy away from flexing their artistic muscles. Most present a vision of what the town could be, with big bold ideas and creative energy such as in the Chula Vista redevelopment plan. During this meeting – the second public presentation by Dana Point Partners – the developers did look a touch nervous with audience members, many boaters, hurling questions mostly related to parking and the marina. The developers, though dropping a few hints about their ideas, did not present descriptive renderings, instead focusing on the “priorities” ahead. From the outpouring of people at the meeting one could see Dana Point is a boater’s and recreational water activities Mecca. The harbor is also celebrated by an unusually niche history blending modern seaside hobbies with maritime legend. However, Dana Point is also a county-run harbor that has been, at some points, directionless for more than 20 years as business owners, the general public and others have tried up until now to successfully navigate. Though it is clear many hopes are pinned on the breakthrough of this project, audience members did appear to have a healthy amount of skepticism. Boaters will be especially familiar with Ueberroth’s work, which is considered highly reputable in the marina development world. James Lenthall, president of Dana Point Boaters Association and chair of Dana Point Harbor Advisory Board, also spoke to Ueberroth’s character, saying he seemed to be “a man of his word” and he has been relatively transparent with boaters in sharing his plans and visions for the future of Dana Point Harbor. Ueberroth, who had a hand in marina remodels like Alamitos Bay in Long Beach and garnered several compliments during the meeting, generally finds good standing with boaters. The audience entertained many vocal boaters who were intent to be heard and factored into the revitalization’s future plans. Ueberroth, however, said while he looked to keep boaters interests in mind, the revitalization plan took and will take into account many groups of people. The revitalization project’s scope aims to build the harbor best representing everyone living at or visiting Dana Point, Ueberroth added. Ward also referenced a set of “priorities” that needed to be focused on first. One of these priorities was building a parking structure that could be constructed with limited disturbances in the community and to operations. The lease option period (meaning the time period to review the draft of the lease between the Partners and the County), which began on July 30, is heading towards a close after 90 days, ending on Oct. 31. At this point in the game, where are the detailed renderings? A few sketches can be accessed through DPHAB’s official website, but none includes a comprehensive architectural design just yet. Generally, the Hotel, Marinas and Commercial Core Project Schedules lay out the plan. The option period is set to end by Oct. 31 and community engagement will continue for 86 months until March 3, 2025, nearly six years later. The retail and commercial core of the schedule appears to be the forerunner and the finishing date is predicted to be by late September in 2023. Marina developments and wet slips have an estimated completed date of late April in 2027. Hotel developments, which will include a brand new boutique hotel and the restoration of Marina Inn, will not see finalization until around 2030. The Log has actively covered Dana Point’s harbor revitalization since 2015 and has come under heat for some coverage. The Log received documentation over the years referencing $20 million worth of work completed by a previous project manager, Project Dimensions, whose main responsibilities appeared to be setting up a clean slate for developers to come in and begin the project. However, from the discussions that went on at the DPHAB, it initially seemed as if a reset may be on the books. The Log spoke to Molly Nichelson, Public Information Manager for Orange County, and she denied any notions of a reset or starting from scratch. Though documentation sent to The Log had stated otherwise, the county stands firm that the $20 million spent on consultants such as Project Dimensions was spent mostly on developing the Local Coastal Program, or LCP. DPHP will be closely following the standards in the approved Local Coastal Plan, even if they make architectural changes to the buildings, and as they proceed with applications for CDPs for both hotel and marinas (which county/PDI didn’t secure previously). This article was written less than one month before the lease was scheduled to be finalized; The Log, accordingly, questioned whether this would be enough time to unveil more details. At the end of the day, the revitalization process will likely be gradual and will accrue more time. Even though the draft lease is racing towards the end of the option period and a schedule has been planned, there still appears to be quite a few holes and questions that the County and developers will need to address. If there is such a long period left of planning, feedback and more, then why was there such a rush to approve the lease? Either way, a fully revitalized harbor looks to be around 12 years away still – there is surely enough time for continuing input and conversation. DPHAB has made documentation for the harbor revitalization project, including a construction schedule, vessel transition and slip allocation policy, and more, available on the official website at dphadvisory.org.